Diabetes mellitus (DM), or simply known as diabetes, is a chronic, lifelong, medical condition characterized by high blood sugar levels that result from an inherited or acquired defect in the ability of the pancreas to produce insulin or ineffectiveness of the insulin produced or unresponsiveness of the cells in your body to the insulin produced over a period of time. Such defect leads to an increased level of glucose in the blood, which in turn can damage several other systems in our body, particularly the nerves and the vessels. 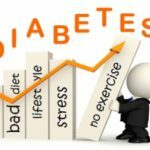 Diabetes affects your body’s ability to use the energy found in food leading to symptoms of frequent urination, increased hunger and increased thirst. Untreated diabetes may lead to acute and serious long term complications, hence, patients with diabetes or suspected with diabetes should seek medical consult for early management. The principal hormone that regulates the uptake of sugar (glucose) from the blood into the cells of the body is insulin. Insulin is a hormone produced by the beta cells found in the islets of Langerhans of the pancreas. This hormone responds to the rising levels of blood sugar, hence, plays a critical role in all forms of diabetes mellitus. Our body needs glucose for energy. The body obtains glucose either from the intestinal absorption of food; from the breakdown of glycogen; from the storage form of glucose found in the liver; or gluconeogenesis, which is a process of generating glucose from non-carbohydrate substrates in the body. However, glucose cannot go into most cells of the body directly. After food intake, blood sugar level rises. This signals the beta cells in your pancreas to release insulin into the bloodstream. Insulin then attaches to the cells (e.g. adipose cells, liver cells) and signals the cells to absorb the sugar in the bloodstream, balancing blood glucose levels. Insulin can also inhibit the breakdown of glycogen or gluconeogenesis. Insulin also converts excess glucose to glycogen for storage in the liver called glycogenesis. In addition, insulin is responsible for the uptake and synthesis of amino acids, proteins, and fats. Overall, insulin has an anabolic effect throughout the body. Therefore, deficiency of insulin or insensitivity of the receptors can lead to diabetes. During fasting or when blood glucose falls to a certain level, insulin release also decreases. Our body begins to use stored sugar as a source of energy through a process called glycogenolysis. Glycogenolysis breaks down the glycogen stored in the liver and muscles into glucose, a process mainly controlled by the hormone glucagon. Insufficient insulin or ineffective tissue receptors result to low tissue uptake of glucose leading to intracellular hypoglycaemia and extracellular hyperglycemia. Intracellular hypoglycaemia can lead to gluconeogenesis, breaking down of fats to form glucose forming high levels of ketones in our body, finally leading to diabetic ketoacidosis. This also decreases protein synthesis leading to cachexia, increased hunger and lethargy. Also, there would also be decreased synthesis of gamma globulins making the patient susceptible to infections. Extracellular hyperglycemia causes hyperosmotic plasma leading to hyperglycaemic coma. When blood glucose exceeds renal threshold, glucosuria occurs. Osmotic dieresis results leading to polyuria, polydipsia, hypokaelemia and hyponatremia. The classic symptoms of diabetes are frequent urination (polyuria), increased thirst (polydipsia), and increased hunger (polyphagia). 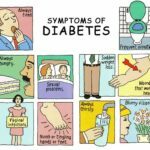 These early diabetes symptoms are more marked and develop more rapidly in patients with type 1 diabetes than in patients with type 2 diabetes. 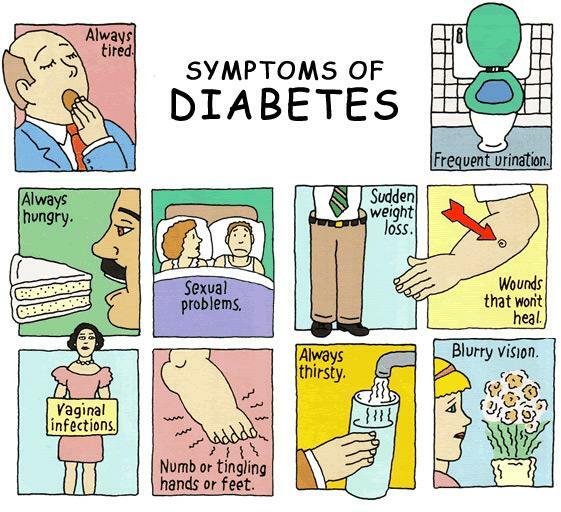 Several other diabetes signs and symptoms can mark the onset of diabetes, but they are not specific to the disease. These include weight loss, blurring of vision, tiredness, itchy skin, slow healing of wounds, headache and dizziness. Diabetic dermadromes which are skin rashes sometimes can also occur in diabetic patients. Also known as “insulin-dependent diabetes mellitus” (IDDM) or “juvenile diabetes”. This condition affects both adults and children but was traditionally referred as “juvenile diabetes” because majority of the cases were of a younger age, usually childhood, as compared with the type 2 diabetes. Type 1 DM results from the failure of the pancreas to produce enough insulin. This is characterized by loss of the insulin-producing beta cells of the islets of Langerhans in the pancreas, resulting to insulin insufficiency. IDDM is further classified as immune-mediated or idiopathic. Most of the cases are of the immune-mediated type, wherein T-cell-mediated autoimmune attack results to the loss of the beta cells of the pancreas leading to insulin deficiency. This type of diabetes may be caused by genetic predisposition. Also known as “non insulin-dependent diabetes mellitus” (NIDDM) or “adult-onset diabetes”. This is the most common form of diabetes, accounting for 95% of the cases. This type of diabetes is used to be called as “adult-onset” because most of the cases are adults but with the epidemic of overweight and obese children, more teenagers are now developing type 2 diabetes. The main cause is overweight, obese and sedentary lifestyle. Women who never had history of diabetes but have high blood sugar levels only during pregnancy are said to have gestational diabetes. This is attributed to the hormones (e.g. human placental lactogen) produced by the placenta needed for fetal growth which block the mother’s insulin in her body, resulting into a condition called insulin resistance. Babies born to mothers who are untreated gestational diabetes are at risk for large gestational age, jaundice and hypoglycaemia. If severe, this can also cause seizure and stillbirth. Women with gestational diabetes need more insulin than normal women. Although insulin does not cross the placenta, glucose and other nutrients do. Glucose causes the fetal pancreas to produce more insulin leading to fetal hypglycemia. Women with gestational diabetes have greater risk of developing type 2 diabetes later after pregnancy and have greater chance of caesarean delivery due to large babies; their offspring are also prone to develop obesity and type 2 diabetes later in life. For most women who are pregnant, it doesn’t cause any noticeable gestational diabetes symptoms and early stage signs. Testing should be considered for all individuals who are overweight or obese (BMI 25 or greater) plus the additional risks: first degree relative with diabetes mellitus or Polycystic Ovarian Disease, history of gestational diabetes, thyroid disorder, HDL level < 35 mg/dl and/or Triglyceride level >250 mg/dl, hypertensive, sedentary, impaired glucose tolerance (IGT) or impaired fasting glucose (IFG) on previous testing, women who delivered macrosomic baby (e.g. weighing > 9lbs), and other clinical conditions such as acanthosis nigricans, severe obesity, polycystic ovary syndrome, dyslipidemia. In the absence of the characteristics above, testing for diabetes should begin at age 45. If results revealed to be normal, testing should be repeated at least every 3 years, with consideration of more frequent testing for those with prediabetes. 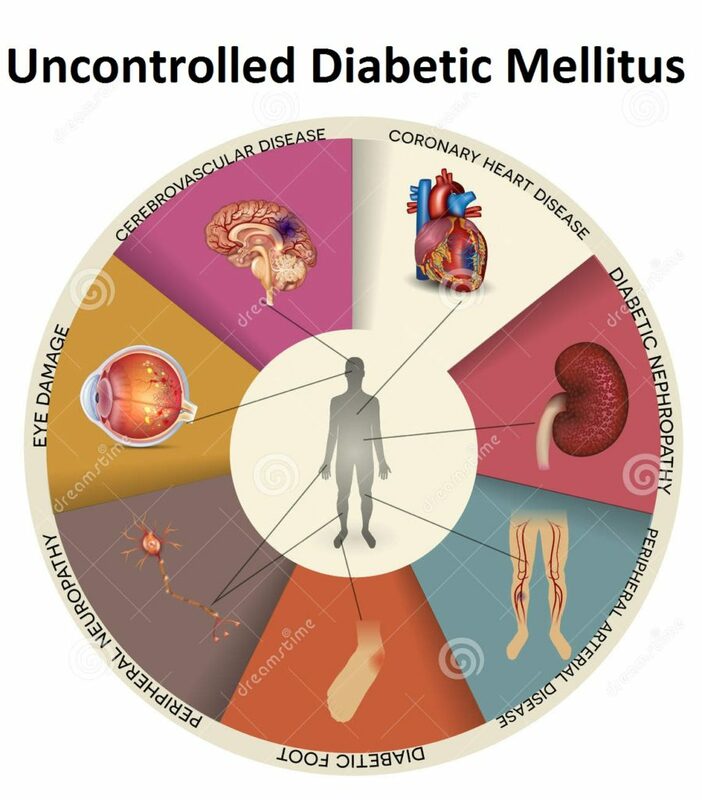 Having an uncontrolled diabetes mellitus will be a very problematic problem for every patient, you may check about the picture to see the effect of it. 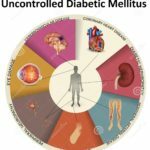 There are no definite reason of having Diabetes Mellitus, some of them came from genetics, some claim from in-born and etc. But most of reason is because of having a unbalance eating diet, stressful lifestyle and lack of physical exercise. Diabetes mellitus can be diagnosed either by a fasting plasma glucose level ≥ 7.0 mmol/l (126 mg/dl); random plasma glucose ≥ 11.1 mmol/l (200 mg/dl) with symptoms of hyperglycemia (e.g. polydipsia, polyphagia, polyuria); plasma glucose ≥ 11.1 mmol/l (200 mg/dl) two hours after a 75 g oral glucose load as in a glucose tolerance test; or glycated haemoglobin (Hb A1C) ≥ 6.5%. Fasting means no food and water intake for 8 hours. In the absence of the unequivocal hyperglycemia, result should be confirmed by repeat testing. Unless the diagnosis is clear on clinical grounds, such as the patient is experiencing symptoms of hyperglycemia or with hyperglycemic crisis, test result diagnostic of diabetes should be repeated to rule out laboratory error. It is preferable that the same test be repeated for confirmation, since there will be a greater chance of concurrence in this case. For example, if the A1C is 7.5% and the repeated result is 7.0%, the diagnosis of diabetes is confirmed. As of this writing, there is still no known preventive measure for type 1 diabetes. 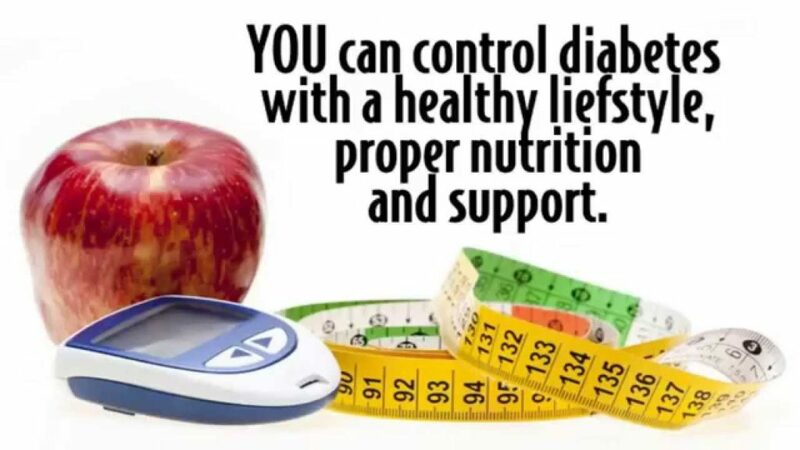 Type 2 diabetes can be prevented by maintaining a normal body weight, physical activity, and a healthy balanced diet. Dietary modifications include diet rich in fiber and whole grains, choosing good fats, such as the PUFA or polyunsaturated fats found in nuts, vegetable oils and fish. Avoid sugary drinks and sodas and eating less red meat and other saturated fats can all help prevent the development of diabetes. Smoking cessation is also an important preventive measure as well. Aggressive lowering of glucose level is not always the best strategy in all patients. The goals of treatment should be individualized based on the age of the patient, duration of diabetes, life expectancy, comorbidities and other individual considerations. A1C is the primary target for glycemic control. 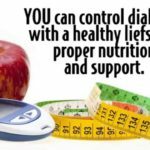 The primary goal is to achieve near normal blood glucose levels, as evidenced by A1C as close to 7% as possible which can reduce the risk of complications such as retinopathy, nephropathy, neuropathy and cardiovascular disease. However, in patients with advanced type 2 diabetes who are at higher risk for cardiovascular events, reducing HbA1c to 6% or lower may increase the risk of cardiovascular disease. Individual risk stratification is therefore highly recommended. Decrease effects of sulfonylureas: corticosteroids, isoniazide, oral contraceptives, estrogens, thyroid hormone, sympathomimetics Glyburide implicated in negative outcomes post-MI. Improves insulin sensitivity nausea, diarrhea; often resolve after 2-3 weeks of use; lactic acidosis: rare Increase effects of metformin: iodinated contrast media, ethanol, ioversol, bittermelon, cimetidine, ciprofloxacin,digoxin, levofloxacin, ranitidine, norfloxacin. Decrease effects of metformin: atazanavir, darunavir, fosamprenavir Do not administer until 48 hours after procedures involving intravascular iodinated contrast media and resume therapy only when normal renal function returns. Avoid in alcoholic patients or patients with liver or kidney disease due to increased risk of lactic acidosis. The major nonglycaemic effect of metformin is either weight stability or modest weight loss. Miglitol Acts on gut epithelium delaying dietary absorption of complex carbohydrates thereby lowering postprandial glucose Acarbose: abdominal pain, diarrhea, bloating, flatulence, increased LFTs Primarily lowers postprandial glucose without causing hypoglycaemia. Increases peripheral glucose utilization edema, weight gain, hypoglycemia, diarrhea, increased LFTs Thiazolidinedines are metabolised by cytochrome P450 2C8 (and by CYP3A4 for pioglitazone), but at conventional doses apparently do not affect the activity of those enzymes. Not recommended for patients with heart failure NYHA class III or IV, CYP450 drug interactions, or with history of CAD. Dipeptidyl Peptidase IV (DPP-IV) inhibitor Inhibits dipeptidyl peptidase IV (DPP-IV) enzymes resulting in prolonged active incretin levels nasopharyngitis, headache, nausea, hypersensitivity and skin reactions, Excreted unchanged by the kidneys and a reduction of dose is recommended with renal impairment. Slows gastric emptying hypoglycemia Nausea, diarrhea, vomiting acute pancreatitis: rare Not recommended to be used in patients with gastroparesis or severe gastrointestinal disease. minutes 3- 5 hours Lispro insulin (Humalog ) should be given 0-15 minutes before a meal or immediately after a meal. 6-23 hours Insulin Glargine has no pronounced peak. 12-24 hours Humalog Mix 75/25 should be given 0-15 minutes before a meal or immediately after a meal. 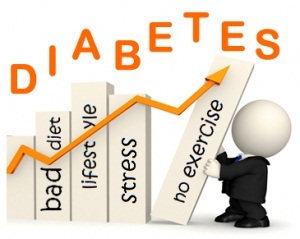 Diabetes recommendation is effective for improving clinical outcomes and quality of life. Therefore, it should be publicly recommended to all type 2 diabetic patients regardless of the treatment mode. However, these recommendations should be individualized according to patient’s glucose and lipid goals. Balanced diet is emphasized, consisting of 50-60% energy from carbohydrate, 15-20% energy from protein and 25-30% energy from fats are encouraged. High fiber diet (20-30g fibre/day or 5-7 servings/day) consisting of vegetables, fruits, legumes, oats, granola, corn and whole grain cereals is also recommended. Loss of body weight by 5-10% of the initial body weight over a 6 month period is encouraged for all overweight or obese individuals who have or are at risk for diabetes. This can be achieved by reducing caloric intake by 20-25 kcal/kg body weight and increasing physical activity by at least 150 mins/week or 5 days a week of moderate-intensity aerobic exercise and with no more than 2 consecutive days without physical activity. Brisk walking is recommended for all. Regular meal timings is also important. Avoid skipping meals. Patients with diabetes should do a pre- and postprandial glucose in order to evaluate postprandial glucose and to achieve postprandial glucose goals with a variety of foods. Try to avoid or limit intake of saturated fatty acids, trans fatty acids, and cholesterol to decrease the risk of cardiovascular disease. In order to prevent low blood sugar, medication doses can be reduced or extra carbohydrate can be consumed before or during exercise. If glycemic goals are not achieved with lifestyle modifications within 3 months, oral medications should be initiated. As first line therapy, Metformin is the number one choice. Other oral medications are acceptable alternatives. If monotherapy fails, combination therapy is recommended. Oral medications are not recommended for pregnant women or in patients diagnosed to have diabetes during stress, such as infections. Insulin would be more appropriate in this case.